Learning communally during the first year reduces attrition among new beekeepers, who are working with aggressive Africanized bees. Photo by Julia Luckett Photography, courtesy of Food 4 Farmers. By now it’s common knowledge that bees are in jeopardy throughout the world. As agricultural practices have intensified and pesticide use has increased, bee populations are being decimated. New research exploring the effects of bee pollination on quality and quantity of coffee shows promise both for bees and coffee farmers. Pollination by bees and other animals contributes five to eight percent of global crop production value, varying widely among crops — from 0 percent in wheat to 95 percent in squash and pumpkin, for example. And while coffee production isn’t as dependent on bees as other crops, research shows that pollinators do impact productivity and quality. 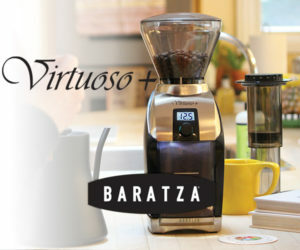 Because Arabica is self-fertilizing, it will still set fruit even without cross pollination. That doesn’t mean bees don’t help, however. Bee pollination increases fruit retention, seed mass, and finally the yield of mature fruits. Researchers have been working to understand the contribution of bees to coffee production for decades. In Panama, Smithsonian researcher Dave Roubik found that bees accounted for 36 percent of coffee production, of which 25 percent was due to honey bees. In Indonesia, bees’ contribution was estimated at 12 percent. That’s where that 10-20 percent “pollination effect” comes from. 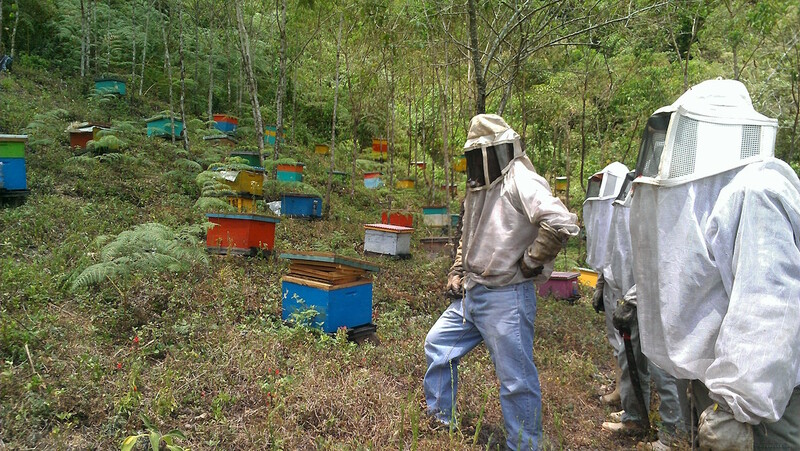 Beekeeping fits nicely with coffee farming, since harvests rarely compete, and beekeepers can maintain apiaries working them on weekends. 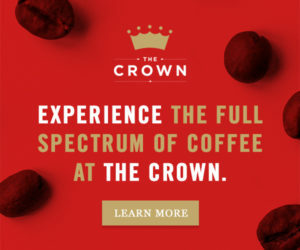 While coffee itself provides few nesting sites and food for bees, bee diversity and abundance depend on the presence of trees inside or around the coffee farm — demonstrating an additional benefit of shade-grown coffee. Forest surrounding a coffee farm can contribute to increased yields of 20 percent, while reducing peaberries by 27 percent. In countries like Mexico and Guatemala, where shade-grown coffee and diverse, rustic farms adjacent to forests are common, coffee agroecosystems host double the richness of bees, resulting in a 20 percent higher fruit set compared to specialized shade and sun-grown coffee common in Brazil and Costa Rica. 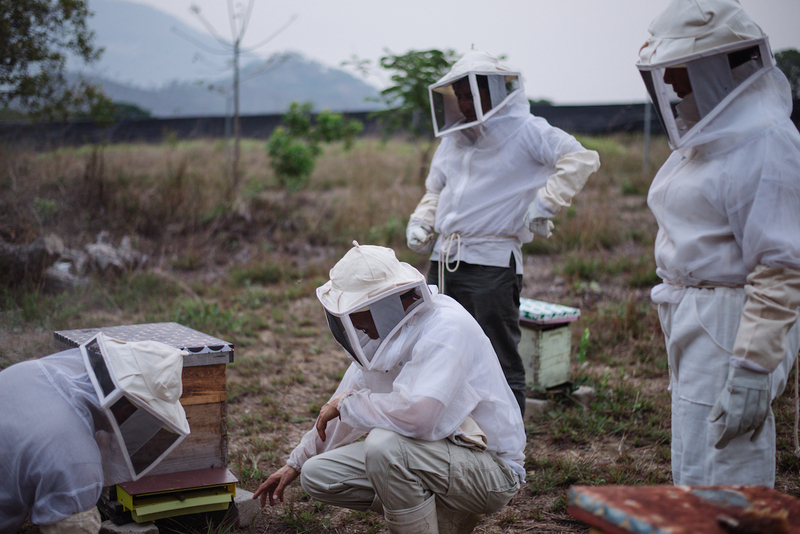 Food 4 Farmers, a nonprofit organization helping coffee-farming families address seasonal hunger, has been supporting beekeeping projects in Mexico and Guatemala — with more of their co-op partners in Colombia and Nicaragua waiting to join in. 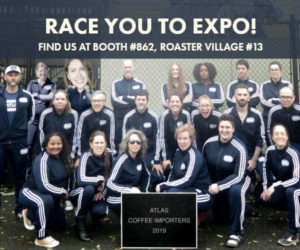 While beekeeping projects were initially introduced to diversify income and strengthen food security, results are showing a tangible impact on coffee as well. 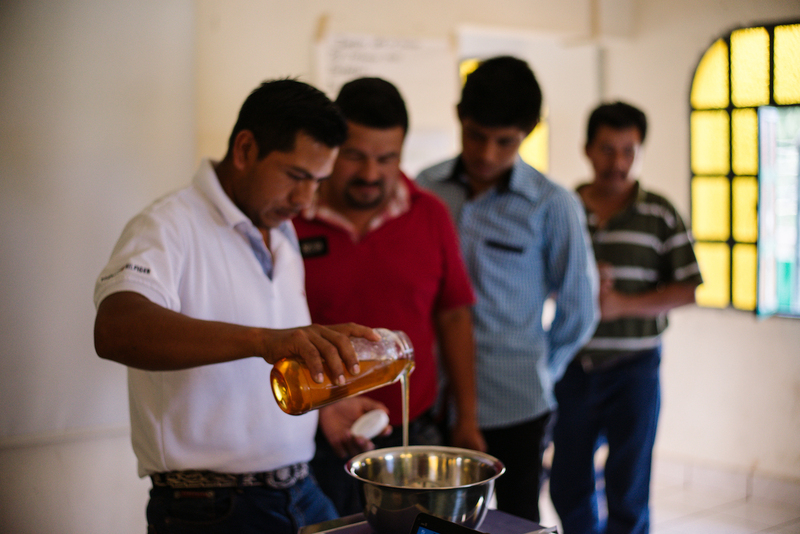 In Chiapas, Mexico, where Food 4 Farmers is working with the CESMACH coffee cooperative to diversify and improve livelihoods through commercial beekeeping, this impact can inform farming practices in other key coffee-growing regions. Chiapas is by far the most prominent coffee-producing state in Mexico, accounting for 43 percent of the country’s annual production of 824,000 tons, and representing a value of $90.4 million. Cesmach beekeepers are now harvesting high quality, organic honey for export to the EU. Photo by Julia Luckett Photography, courtesy of Food 4 Farmers. Given the 10-20 percent “pollination effect” on coffee, it’s estimated that bees’ service in coffee agroecosystems could be worth $9 to $18 million in Chiapas alone, $22 to $44 million in Mexico, and $180 to $360 million worldwide. And, this doesn’t account for their role in pollinating other crops that contribute to food security and livelihoods for all kinds of smallholder farmers. Chiapas offers fertile ground for improving our knowledge of pollinators’ effects on coffee, as most coffee is grown under high diversity shade. This is particularly true in El Triunfo area, part of the Sierra Madre region – and stands in contrast to the Altos region, where coffee is secondary to pasturelands and shade is provided by a limited variety of planted trees (mainly Inga genus). The better we understand the relationship between coffee management and bee diversity and abundance, the more we can improve both livelihoods and landscapes. 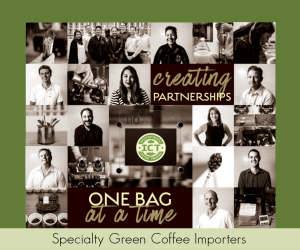 The ultimate goal is to equip farmers to improve the stability and reliability of coffee production with shade trees that can better support diverse pollinator populations. 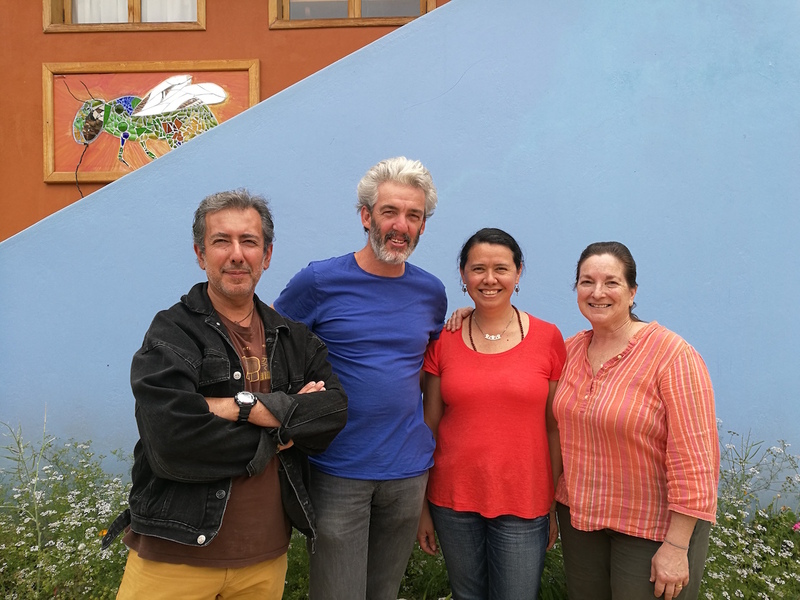 From left: Ecosur’s Luis Modragon and Remy Vandame, and Marcela Pino and Janice Nadworny of Food 4 Farmers. Food 4 Farmers is raising funds to conduct research in Chiapas with Ecosur, colleagues from the University of Vermont’s Gund Institute, and CESMACH, to determine the degree and interdependency of relationships between bees and coffee. 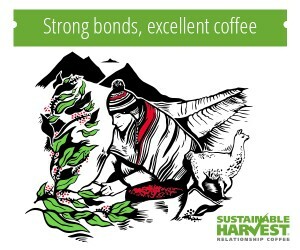 The underlying belief is that better livelihoods and better coffee can go hand-in-hand, providing food security for families and a more sustainable supply of high-quality coffee. Rémy Vandame, researcher at El Colegio de la Frontera Sur in San Cristóbal de Las Casas, Chiapas, coordinates a team of 25 people working a range of topics, from the ecology of tropical bees and the effects of agriculture and pesticides on bee diversity, to the support of farmer organizations in technical and social aspects linked to honey bees and stingless bee management. Janice Nadworny is Co-Director of Food 4 Farmers, an organization working with coffee-growing organizations tofight food insecurity in Latin America, through family and community resilience and greater opportunities for sustainable livelihoods. 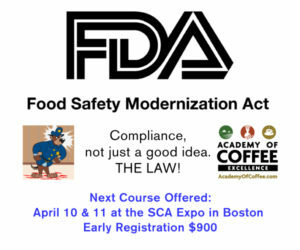 She has been a member of the SCA Sustainability Council since 2009, and has worked in marketing, management, development and outreach for more than 30 years.